Tomato -- 2 1/2 nos. Marinate the shrimp with the given items for minimum half an hour or do it overnite. This ensures shimp to be juicy when it's cooked. Take a kadai and add both ghee and oil together. Add the cinnamon,cloves,cardamom once the ghee melts and fry for few minutes. Drop in the mint and cilantro leaves as well and fry for 5 sec. Add the sliced onions and cook well. at this point add the salt to make the onions leaves moisture and cook fast. Followed by ginger garlic paste and saute well. Dump in the tomatoes and cook until the tomatoes r totally disintegrated. U may now add the turmeric powder,red chilli powder and the marinated shrimp mixture into this and saute well for 2 minutes so that it blends with the masala. Finally add the lemon juice and stir together with the masala. Keep this masala aside. Soak the rice for 10 minutes. By the time take a big pot /bowl and fill it with 3/4 of water and add oil and all the garam masala. Give it a boil. Add the rice slowly and cook for exactly 5 minutes ( 3/4th cooked ). U may take out the masala's now and drain the water . Take the briyani pot and add half the shrimp masala and then add the half quantity of hot steaming rice straight after draining . Top the rice with another layer of the remaining shrimp mixture and then followed by remaining hot rice. U may add some mint /coriander leaves in b/w the layers if u wish. Dilute the saffron colour with little warm milk /water and drizzle on the top of the rice. Cover the vessel with a cotton cloth (preferably very thick ) and seal it. Close the lid very tightly . Heat a dosa pan and place the briyani pot on top and cook for 15 minutes. Make sure no steam escapes while cooking.. 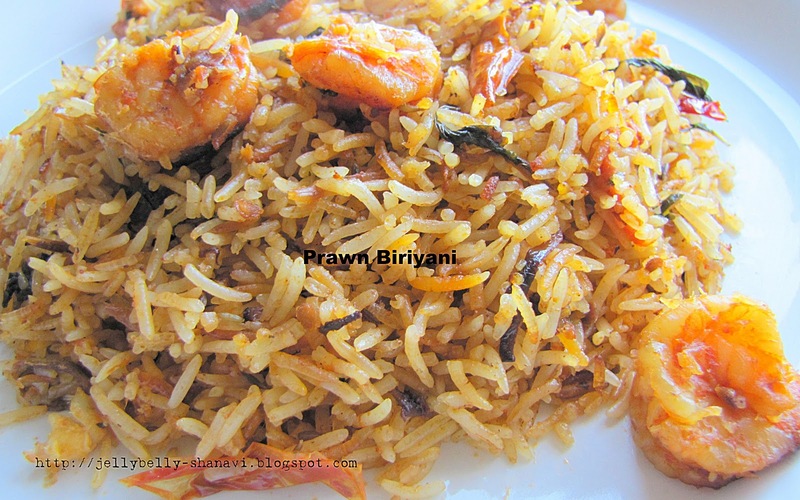 Remove the lid and by using the fork mix the rice gently without breaking it and have it..
Ur delicious Shrimp / Prawn dum briyani is ready to serve. Update: I didn't add curd as the lemon juice adds more flavour and tangy taste to the dish. Also tomato is there, this amount of lemon juice is sufficient enough. Look at the rice.. all separated and perfect.. it looks soo delicious..
Omg, am inviting myself to ur place Shanavi,sooo tempting and prefect looking briyani.. This is a perfectly cooked dum biriyani Shanavi, i love the texture and color of the rice. Great job!! This biryani looks perfect, love dum method. Looks awesome,perfectly cooked biryani,makes me hungry. 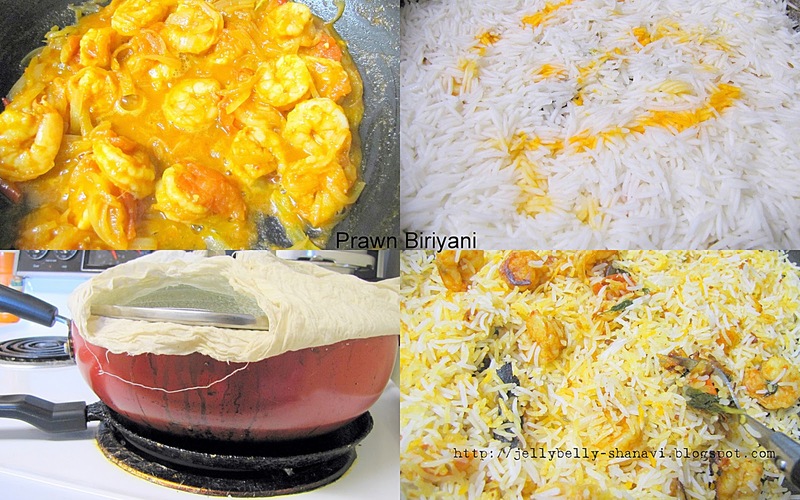 Prawn Shrimp Biryani simply looks exotic and mouth watering. yum. What heat level should the tawa for cooking the biriyani for 15 minutes? What heat level should the tawa be for cooking the biriyani for 15 minutes? Hi Balamani Thirumurthi, It's better to heat a dosa pan in medium flame until it's very hot and keep the biriyani pot( with biryani) on top of the dosa pan and bring down the flame to medium to medium low. Cook for 12 to 15 minutes. Hope I've cleared ur doubt and thanks for dropping by.